Reference Advertisement No. 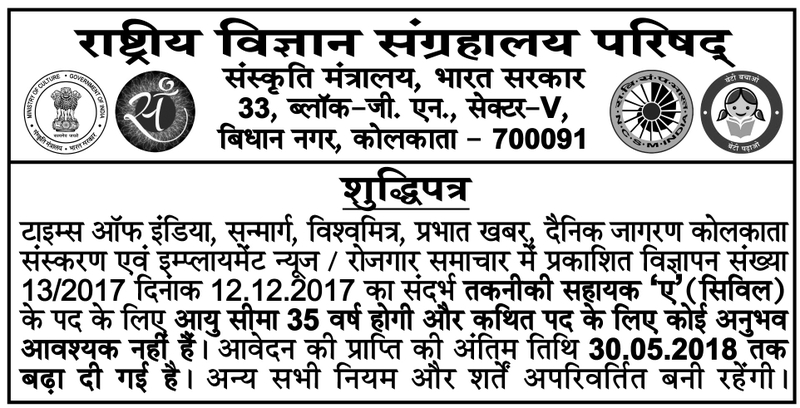 13/2017 dated 12.12.2017, published in the Kolkata editions of Times of India, Sanmarg, Vishwamitra, Prabhat Khabar, Dainik Jagran and Employment News/Rojgar Samachar. Age limit for the post of Technical Assistant ‘A’ (Civil) shall be 35 years and no experience is required for the said post. The last date of receipt of application has been extended up to 30.05.2018. All other terms and conditions shall remain unchanged.